You probably guessed by now that we, at On Pins and Needles, are big fans of Special Collections and FIT Archives. What is housed on the shelves of this department is a dream come true for every fashion scholar and researcher. That’s why I felt super lucky when, as an intern, I was given the opportunity to work on one of the gems of the collection. It is nicknamed ‘the oldest book’, because a) it IS the oldest book in the collection (dated 1680) and b) it’s real name is not very easy to pronounce (Vestitus Sacerdotum Hebraeorum). And if you were wondering why I was the one given this opportunity, well that’s part of the story. So let’s back up a little bit, Vestitus Sacerdotum Hebraeorum aka the oldest book, was written at 1680 in Amsterdam by Johanne Braunio (1638-1708). As its Latin name might suggest, the book centers on the vestments of Jewish priests, and is written mostly in Latin. It has been in the possession of FIT for at least two decades, though if you search the catalog you’ll find very little information on the content of the book. And this is where I come in. Along with Latin, the book also has many references in Hebrew, which I speak, read and write pretty well. I must say it’s the first time this knowledge has come to good use… The Hebrew text in the book allowed me to make better sense of what it really contains. That and some good old online research. So what’s this old book really about? Turns out it is the most comprehensive historical research ever to be made on vestments of Jewish priests who served at the Jewish Temple in Jerusalem. The book is composed of two volumes (bound together), and contains seventeen beautiful engravings attributed to Bastiaan Stoopendaal. 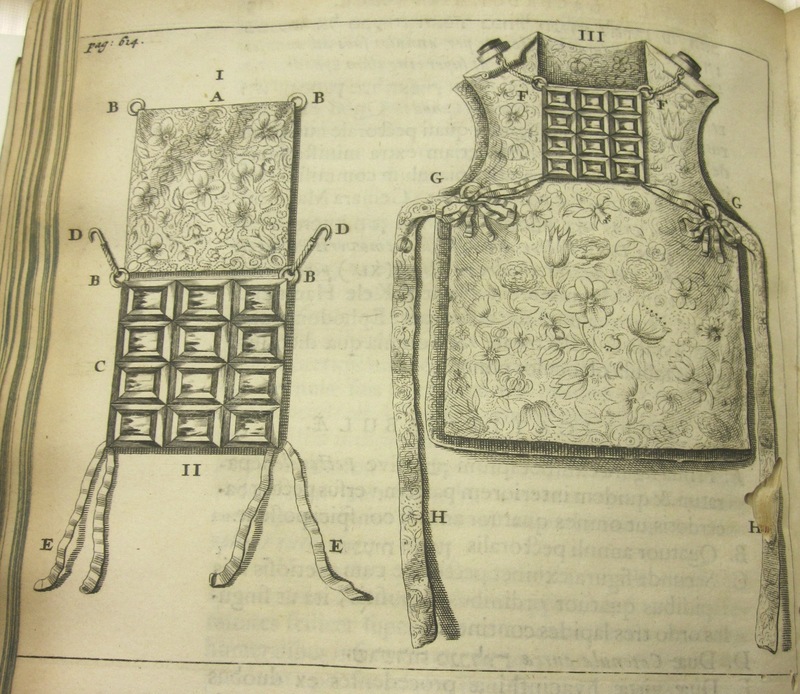 The book, on all its 800 plus pages, is a detailed research of not only the different types of garments, but also of the materials from which they were made, and their origin. The author cites biblical sources and explains the process of making each material and each garment. The book opens with the below illustration, which is also a table of content of sort. The first volume centers on the materials and the process of making the colors and fabrics, by who they were used, how and when. While the second volume centers on each garment, how it was made and when and how it was worn. Volume 2, page 451. Illustration of breeches (Michnasayim). The breeches were made of pure linen and used as an undergarment to cover the body from waist to knees. Volume 2, page 499. 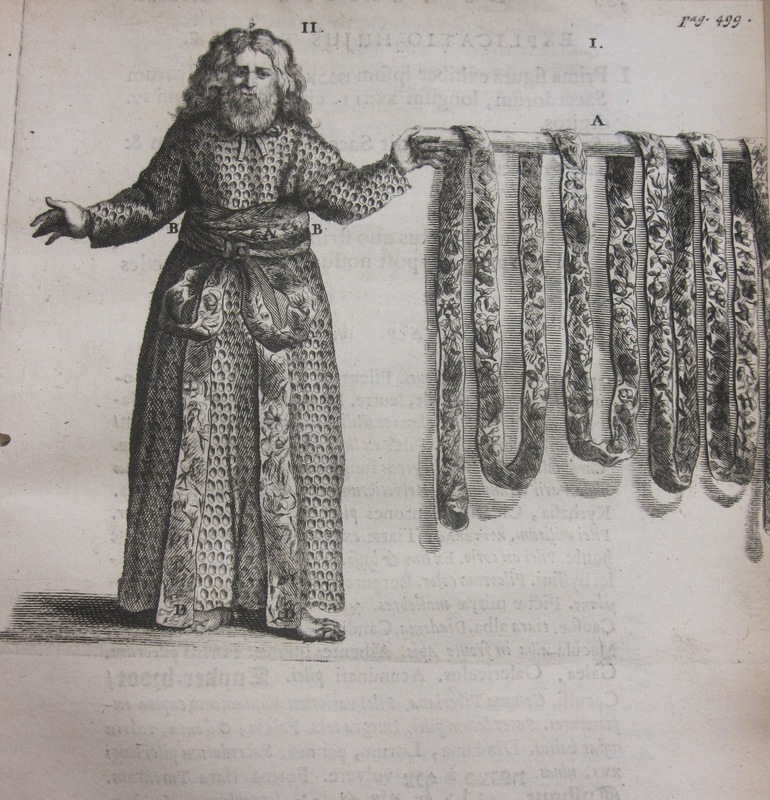 Sash (Avnet), this illustration depicts a priest dressed in tunic with a sash wrapped around his waist, as well as a separate depiction of the sash as it hangs loose, open and unwrapped, to illustrate its length. The sash is made of fine linen, and the one depicted here was probably worn by the high priest as it seems to be embroidered, a priest's sash would have been plain. The sash was worn over the tunic, which in turn was worn over the breeches, reaching from neck to feet, and made of two pieces of fabric. According to biblical sources, the tunic of the high priest was embroidered and the that of the priests was plain. 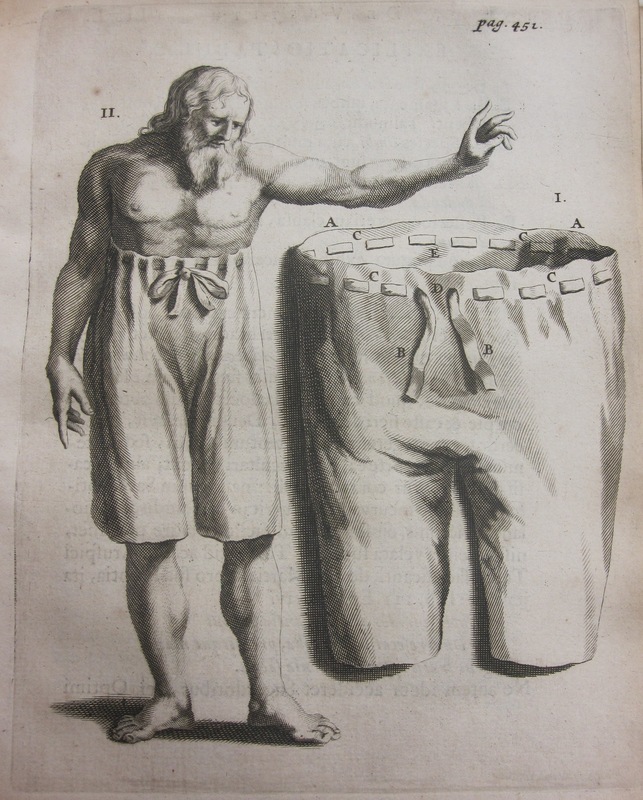 Volume 2, page 614.Vest (Ephod) and breastplate (Hoshen). The breastplate, set with precious stones,was worn by the high priest over the vest, the illustration depicts how it was tied and attached to the vest. The vest was made of two pieces of fine linen embroidered with gold, scarlet, blue and purple threads. In the book the author explains the name and meaning of each gem stone, as well as the specifics of its placement on the breastplate and its origin. 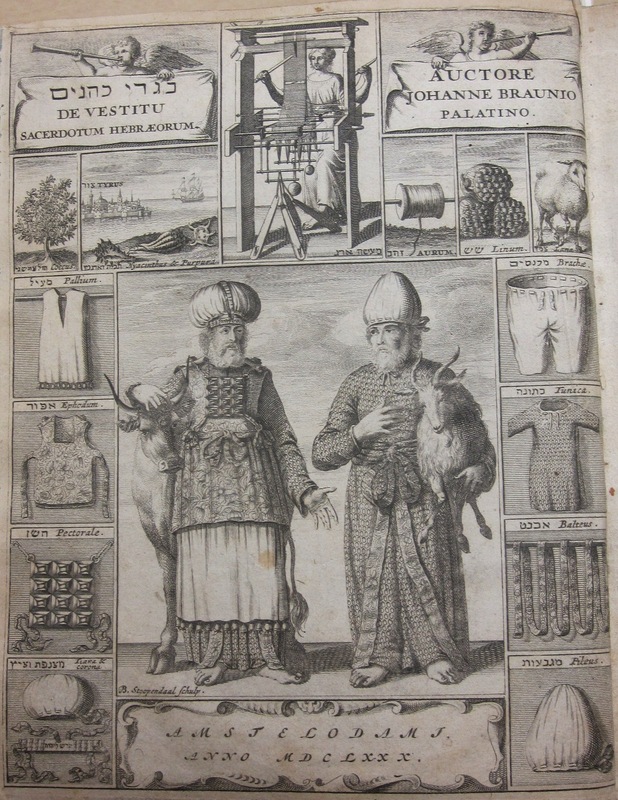 Towards the end of the book, after attending to each garment separately, the author shows the priest and high priest fully dressed. Volume 2, page 822. 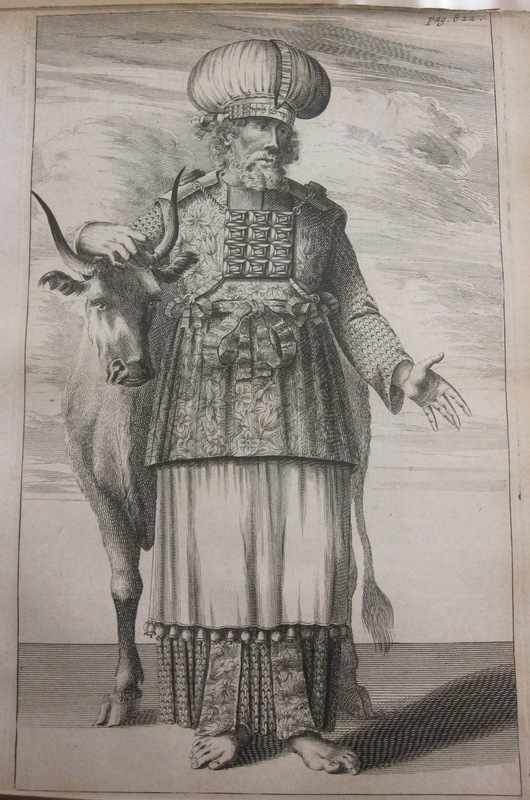 Fully clothed high priest, the illustration shows how the different vestments were worn together to form a complete outfit. The vestments (in the order in which they were worn): linen breeches (Michnasayim), tunic (Ketonet), sash (Avnet), robe (Me'il),vest (Efod), breastplate (Hoshen) and headdress and golden crown (Mitznefet and Tzitz). Although the Hebrew in the book is not exactly contemporary, and biblical terms are not my forte, and although making sense of the very little text I could read was not easy, I truly enjoyed this project. I felt privileged to hold a book that survived centuries and owners. The fact that the book not only contains meaningful historical research, but also has an history of its own is what made this project so exciting. If only books could talk! This entry was posted in Research and tagged FIT archives, History of Costume, Jewish priests, Special Collections, Vestments. Bookmark the permalink.